These four mobile apps can increase customer satisfaction and your profits. Answer customer questions quickly - and with confidence. 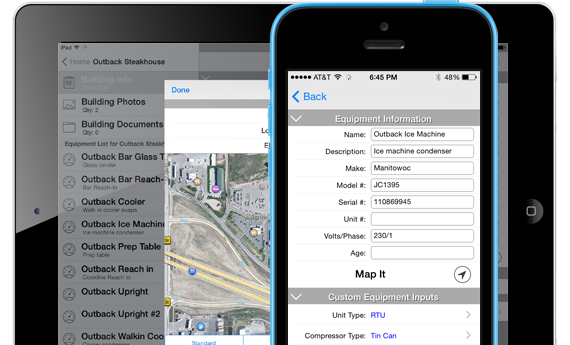 With the HVAC Equipment Locator, securely view and share equipment and service record info - in the field or at the office. Calculate loads, explain work and send reports from on-site. HVAC ResLoad-J offers on-site sizing of heating and cooling equipment, visual reports for customers and ACCA-approved reports for permit approval. Calculate refrigerant charge calculations on-the-fly. Perform real-time superheat and subcool refrigerant charging calculations for more than 100 refrigerant types. Deliver better performance when sizing ducts. 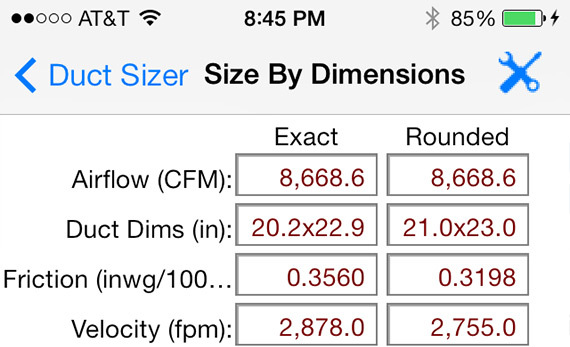 The HVAC Duct Sizer allows for quick duct sizing with various air flow and duct shape scenarios, all with an easy-to-use interface and rapid calculations. For today's mobile HVAC contractor. We know HVAC and mobile. Technology can’t replace the skill and knowledge of a quality HVAC installer or technician, but having technology developed by experienced HVAC veterans at your side can improve the service you offer. Carmel Software has been in business since 1995 and regularly works with large HVAC companies like Mitsubishi, Tra of ACCA and ASHRAE and regularly attend and speak at HVAC conferences across the US. These apps will pay for themselves the first few times you use them. Even if your installers and technicians are not currently using smart phones or tablets — one new installation or service contract you win could cover your costs. We’re continually improving our apps based on collective feedback and technology advancements. Once you purchase an app from us, you’ll receive free updates — lowering the cost investment with every update we push out. We help you make the most of it all. Live courses and online videos are available for each of these four apps to get your company up to speed and ensure you’re benefiting from every feature. Visit our site to look at any of the training videos - available at no charge. You can also connect with us on Facebook, Twitter, Google+ and LinkedIn to get the latest release information and message us with questions. 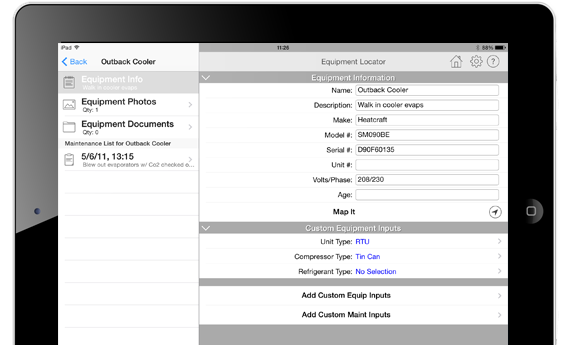 Securely view and share equipment and service record info in the field. Right or wrong, your customers believe you should be able to provide details about the services you’ve offered them - whether it was yesterday or four years ago. The HVAC Equipment Locator solves this dilemma. From the field or from the office, you’ll make a positive impression on customers by having access to the location of every customers’ equipment and their service records. Things like “When was my unit serviced last?” With the HVAC Equipment Locator, the answer is only a few taps or clicks away. That’s just the beginning. Imagine how much more efficient your technicians become when they can pull up the service history on equipment they’re working on, or how much better your marketing can become because you can identify customers who need their equipment serviced. From the field or in the office. All data entered from the field is stored in the cloud using the same data encryption used by banks. Because it’s available from the Internet, staff back at the office can also access the information by signing into your secure account online. Make suggestions on needed service. As your techs are in the field, with accurate service records in hand, they can easily suggest needed services to increase revenue per service call while reducing after-hour calls. Available for free from the App Store. 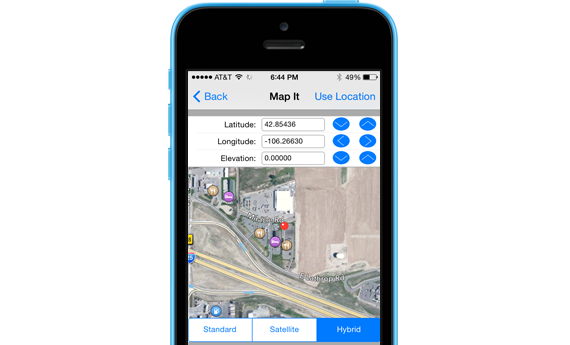 Available for iPhone and iPad, install the HVAC Equipment Locator app today from the App Store and start tracking customer equipment at no cost. Calculate loads as you go, explain work and send reports for approval before you leave. HVAC ResLoad-J offers on-site sizing of heating and cooling equipment, visual reports for your customers and ACCA-approved reports for permit approval. We all know there are other load calculation solutions out there. 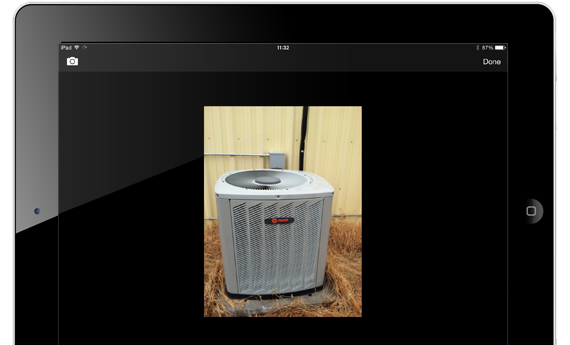 So what’s different about the HVAC ResLoad-J mobile app? 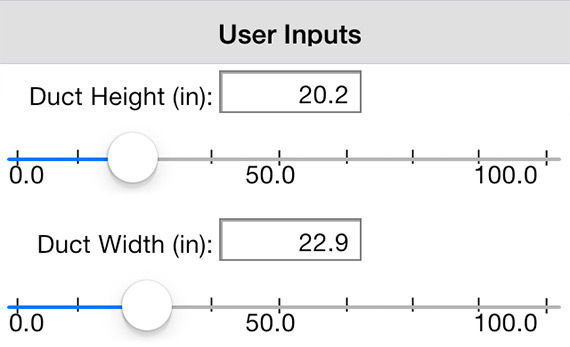 Quick, flexible and accurate load calculations — on site. Using ResLoad-J eliminates calculation errors and provides more accurate results. How? We’ve loaded building materials, openings, shading, appliance loads, local weather and other factors you’ll need to get an accurate load calculation report. On-screen reports make it easier to explain work to customers. Use the built-in reports, graphs and charts to show customers exactly what work you’re doing and why. They will love the transparency and attention to detail — which all lead to a “yes”. 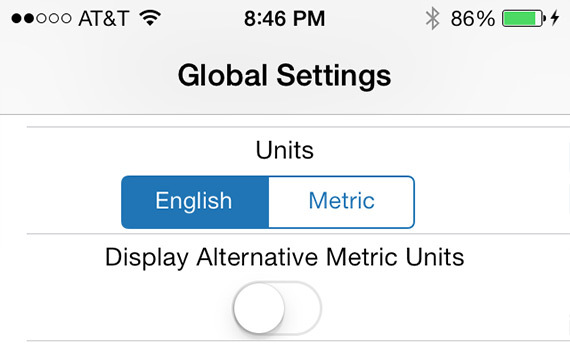 It’s the only native iOS app that’s ACCA approved. Every report you create is ACCA-approved, ensuring the data you send for approval meets ACCA standards. 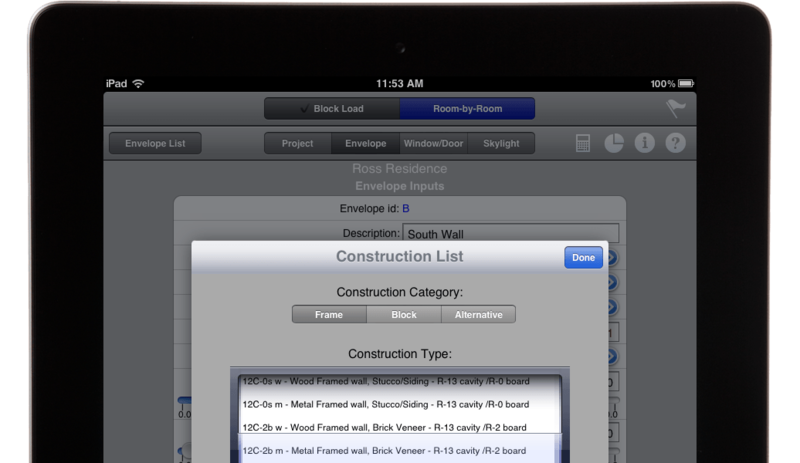 Plus, you can send those reports to authorities before leaving the job site — saving valuable time for approvals. As you enter new information on-site, HVAC ResLoad-J applies it. The whole process can cut the time it takes to perform load calculations in half. Reports sent from HVAC ResLoad-J are ACCA-approved, so you can use them for client records, internal use - as well as for permit approval submissions. Store an infinite number of load calculations for reference later. 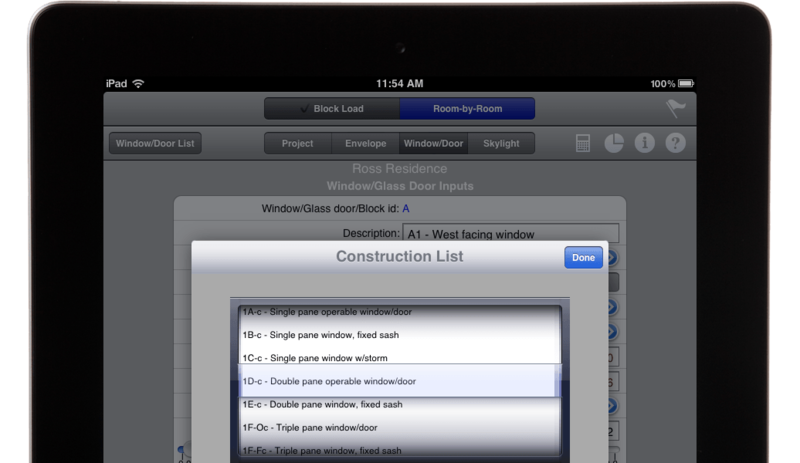 You can even use saved calculations as templates for reworks or similar projects. Once you start using this app, we believe you’ll agree its worth thousands of dollars. It’s available for a one-time fee of $199.99 — no ongoing subscription or renewal fees. The HVAC RefCharge app is a refrigerant charging calculator that allows HVAC technicians to perform superheat and subcool refrigerant charge calculations on-the-fly. 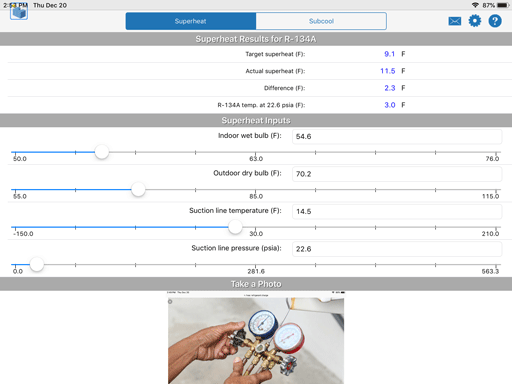 This app includes pressure/temperature data for over 100 common refrigerants (including both dew and bubble versions of many azeotropic refrigerant types). Also, the app is now compatible with iOS 11 and the latest iPhone 8 and X. 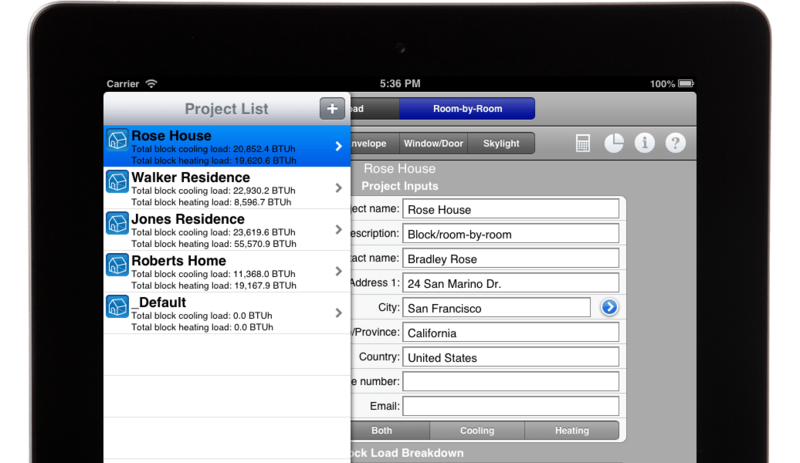 Install HVAC RefCharge on your iPhone or iPad for $9.99 from the App Store. Deliver better performance (and save time) when sizing ducts. For new installations and retrofits. 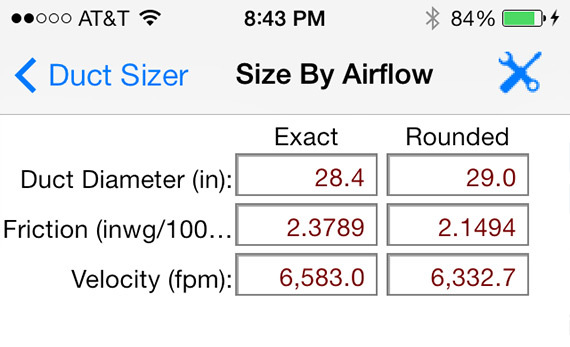 The HVAC Duct Sizer allows for quick and accurate duct sizing with an easy-to-use interface that includes draggable and tappable fields for quick setting adjustments and easy-to-read calculations. As you well know, improper duct sizing will ruin the performance of a unit. And that’s not the only thing it will ruin. Your customer’s pay good money to have work done and if it doesn’t work right from the start — your chances of them calling you again for service drops sharply. 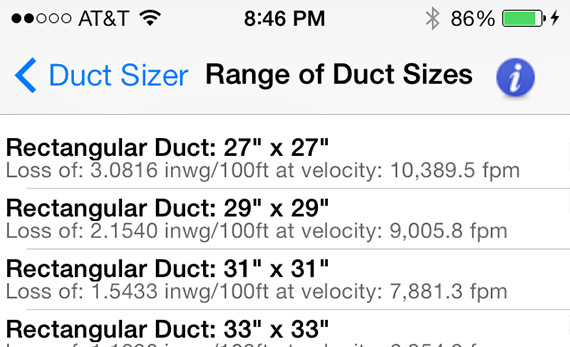 Getting it right from the start is the only option — and using the Duct Sizer app for new installations or reworks is the best method for getting accurate specifications in less time. 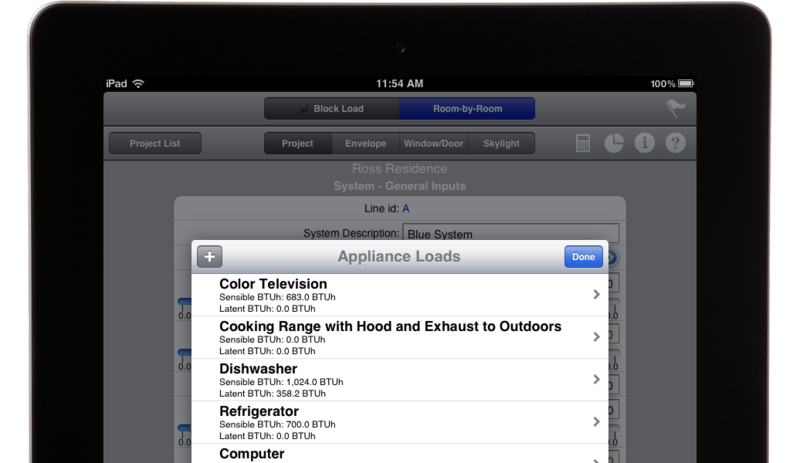 The HVAC Duct Sizer app works on the iPhone, iPad, and Android devices. Download it from the iTunes or Google Play app stores for only $6.99. You can install all of these today from the App Store. 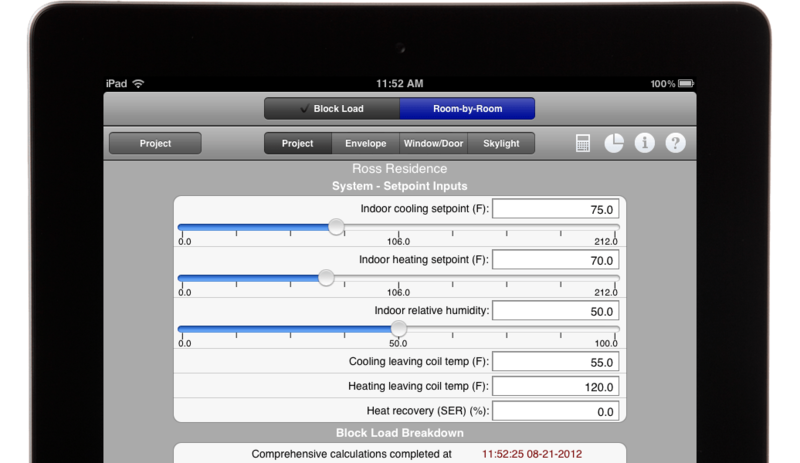 Carmel Software HVAC Mobile Apps have been installed over 60,000 times. Here is what a few of those HVAC business owners, installers and technicians have to say. Visit carmelsoft.com to see how we help thousands of HVAC installers and technicians work easier every day. 2019 © Carmel Software Corporation. All Rights Reserved.